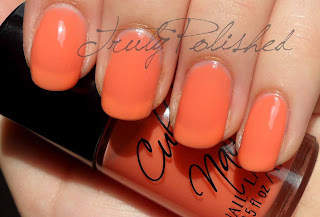 Truly Polished: Cult Nails Scandalous and an apology! Cult Nails Scandalous and an apology! I'm soooooo sorry I didn't do a post yesterday! I know I said I would do one every other day while I'm here but I've just been so chilled out! Yesterday we had a nothing day, we like doing this on holiday! One day instead of laying in the sun or shopping/sightseeing, we stay in our room and watch movies. We watched Something Borrowed and Source Code and just relaxed in the room, then had a lovely dinner. I had planned to do a post after dinner but it was getting really late and I was super tired! 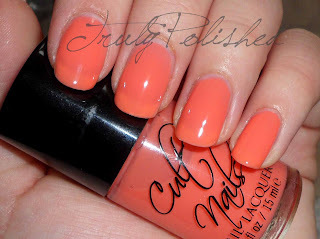 I've been shopping all day in the sun, so I'm really excited for today's post, a really summery polish by Cult Nails! 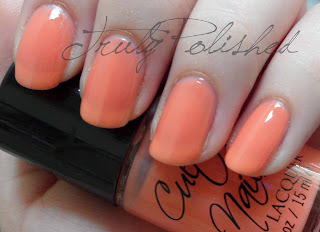 Scandalous is a creamy orange jelly from the new Divas and Drama collection. Maria describes it as the colour of a Creamsicle, but I have no idea what that is, I'm guessing it's an American thing! It's the same colour as the washing tablets I use and I've always thought that was a pretty colour! Application on this was okay, it was sheer but easily buildable, I used four coats for the photos below. This is definitely a shade I'll be wearing a lot this summer. Usually I don't go for oranges, but because this one is such a creamy shade I find it a lot more wearable, especially on toes. You can find this here at Cult Nails where it sells for $10. If you're shy about wearing oranges, this one is a good one to branch out with! I'm trying to find some nice polishes over here in Malta without much success. They have Layla over here but so far I've only been able to find the magnetics. I already have a lot of magnetics at home from other brands, but I'd love to find some holos! I'll let you know if I manage to find any! I love it! I wasn't sure at first about Scandalous and Enticing but I love them both! It just goes to show that you can't always rely on the bottle photos! Love it! Beautiful as always! Thanks Liz! I promise I'll get around to replying to your email!!! !